Along with a couple other items, I recently received a few rolls of 35mm Kentmere 100 (36) from an online retailer. Yesterday I loaded a roll into the Nikon N90s and carried the camera for several hours, making photographs in various places in the city, places that I thought would give me a good idea how the film performs. I couldn’t vary the weather, so all frames were shot in bright, sunny conditions. Because I like a bit of contrast, I typically applied – 2/3 exposure compensation. 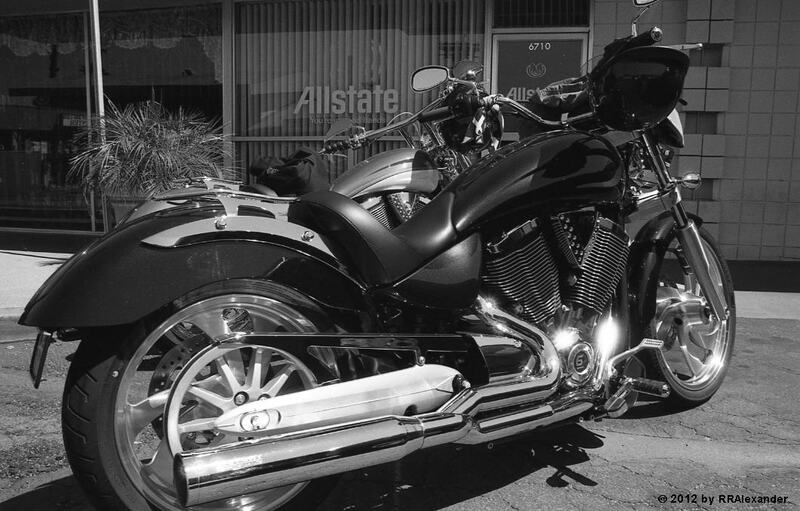 Above: Two Victory motorcycles parked outside a restaurant. The film had nothing to do with the only problem I had, that of dust. Living on the edge of the Mojave Desert is a constant battle against dust. A car washed in the evening will always have a fine layer of dust coating it the next morning. The dust is a problem primarily after negatives are developed. It makes scanning a somewhat involved process. There are a series of compensating actions that I intend to try. Among those actions is the use of a hardener during development, which may make the negatives easier to clean before scanning. Overall, I’m quite satisfied with the performance of the Kentmere 100 film. I have a few rolls of the ASA/ISO 400 version to try sometime soon. The official Kentmere information is quite emphatic about the fact that this is not rebranded Ilford film, though both companies have the same mother company. I wouldn’t have minded if it was rebranded Ilford, but as it is, I’m happy with the look of the film. And the relatively low price is a strong selling point. I did some research and found several different developing times. The official Kentmere information seems to indicate a developing time of 9 minutes (I found the developing matrix less than clear). I developed my reel for 8 minutes with frequent agitation. 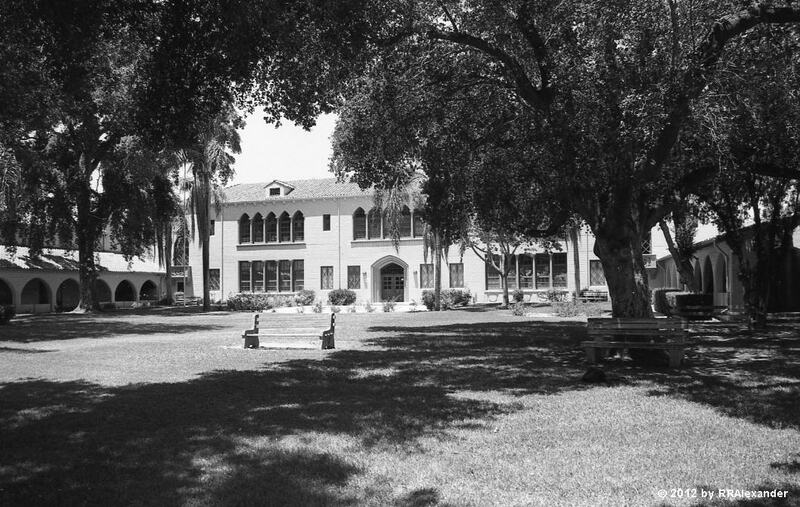 This is the Palm School on Magnolia Avenue in Riverside, California. 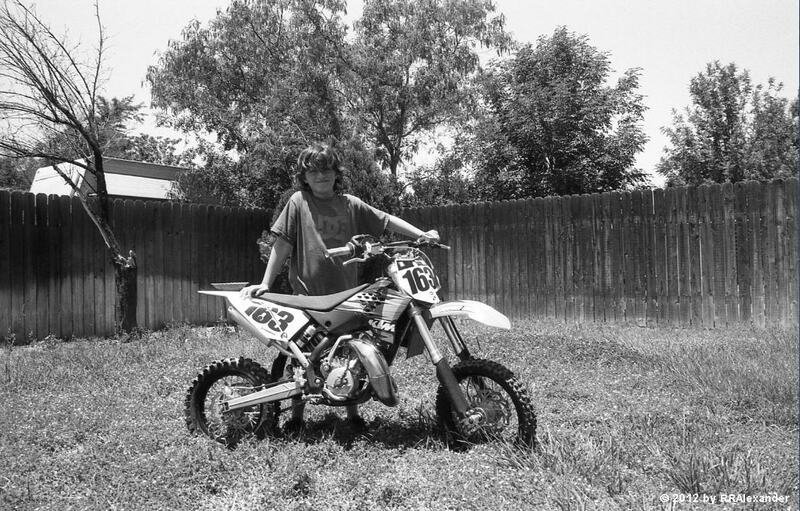 My granson with his 6th racing bike, a KTM. 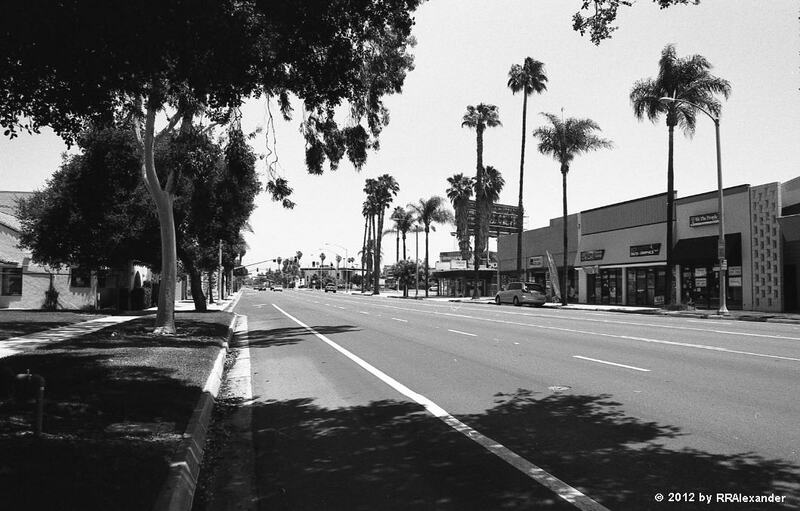 Magnolia Avenue in Riverside, California. This view is to the north from the Palm School. 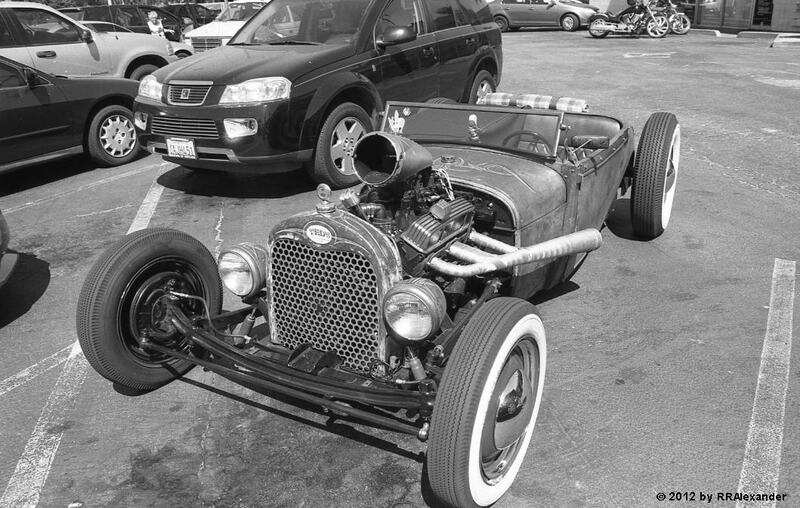 This street rod was parked outside of The Soup Shop in the Brockton Arcade, Riverside, CA.